Morrisville, N.C. (October 12, 2018) – Nufarm announces that a select list of Nufarm brand herbicide products serving the turf and ornamental industry will be available from Monterey Lawn & Garden in quart pack sizes. This small package offering extends the long-standing relationship between these two companies. The core business and expertise in small pack sizes make Monterey an excellent partner in this initial offering. 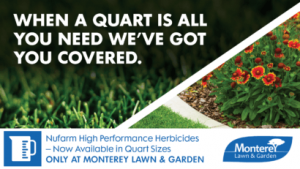 Quart products will be ordered and administered directly through Monterey Lawn & Garden and will not be available through the Nufarm customer service or order desk. Customers will place PO’s directly with Monterey. “This is a new venture for Monterey Lawn & Garden, which will give our commercial users a product that they know, in a smaller case and container size option. We are very excited to have this new relationship with Nufarm and are looking forward to expanding the line of Nufarm products that we currently offer. This gives the end users products in smaller pack options and can be combined with the regular Monterey products when ordering,” says David Selden, Manager – Key Accounts, Monterey Lawn & Garden. About Nufarm Americas Nufarm Americas Inc., is a subsidiary of Nufarm Limited, a manufacturer, supplier and marketer of crop protection products based in Australia. Nufarm is recognized as one of the leading agricultural and turf chemical manufacturers in the world. Nufarm Americas Inc., formulates products that serve the agricultural, professional turf, vegetation management and forestry markets in the United States. About Monterey Monterey Lawn and Garden Products is a subsidiary of Brandt Consolidated and a distributor of plant protection pesticides and fertilizers. Based in Fresno, CA in the heart of California’s agricultural region where we first emerged in 1988 as Monterey Lawn and Garden was established with the goal of offering landscapers and home gardeners the same professional grade technology available to the ag and the turf and ornamental industries. Our growing line of products provide economical and effective solutions to yard and garden problems.